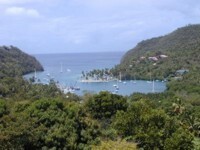 Our most recent holiday abroad was to sunny St. Lucia in the West Indies in March 2004. Lucky us!! It was a lovely holiday. 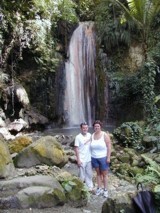 Jo and myself at the Botanica Gardens Waterfall in St. Lucia. The colours on the rock come from mineral deposits such as copper and iron, or so I'm told. We had a superb time in the sunny caribbean and saw most of the island in a day, in a 4x4! 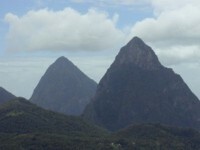 The trip let us see the Pitons. It was great to see the whole island, especially being driven by someone else! That meant we could have a Piton (the local beer) by the Pitons! 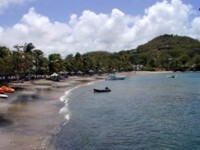 This is Marigot Bay, the place most famous for being in the 'Doctor Dolittle' film. Also has a hotel that can only be reached by boat or swimming! Our driver (Jude) also originated from here. 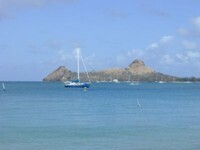 Pigeon Island - It was a key defensive island during the conflicts between France and Britain for control. The former officer's quaters is a nice bar now - The Captain's Cellar. The Club St Lucia beach, has a host of swimming pools behind it (which you can't see!). It was a great trip, hotel was nice enough, and you can't beat the caribbean for relaxing!